In this part of the tutorial, you start from a project that monitors the user programmable button on the NI ELVIS III, and extend its functionality to control the user programmable LEDs. Before starting this part, make sure you have completed the steps to create an NI ELVIS III project. In the Project Explorer window of your NI ELVIS III project, open the Main VI. By default, LabVIEW opens the front panel of the Main VI. The front panel is the user interface of a VI. Press <Ctrl-E> to switch to the block diagram of the Main VI. The block diagram contains the graphical code of a VI. The Main VI contains a Button Express VI which reads the Boolean value from the user programmable button and displays the changes of the Boolean values in the LED on the front panel. The Main VI uses a Flat Sequence structure that contains several subdiagrams. Refer to Structures for more information about the structure of the Main VI. Select View»Functions Palette to display the Functions palette. You can also right-click on the block diagram to display the palette. Navigate to Functions»Academic I/O»Control I/O to locate the LED Express VI. Drop the LED Express VI in the Main Loop of the Main VI by clicking the LED Express VI and then clicking on the block diagram. 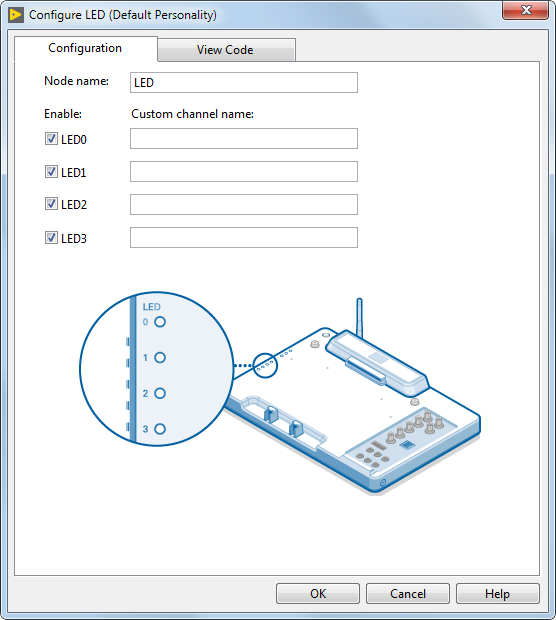 Double-click the LED Express VI in the Main Loop to display the configuration dialog box. In the configuration dialog box, press <Ctrl-H> to display the Context Help window. You can move the cursor over options in the configuration dialog box and learn basic information about the options from the Context Help window. 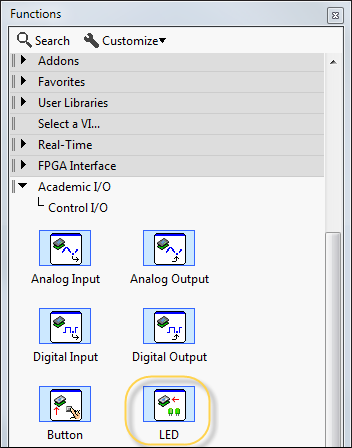 Most objects in LabVIEW display context help information. Select the LEDs to control and click OK to apply your configuration. This tutorial teaches you to control all the user programmable LEDs. 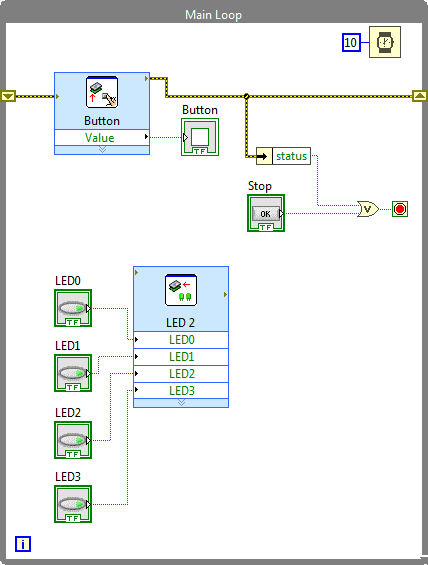 Right-click each input of the LED Express VI and select Create»Control to create Boolean controls for the LEDs. You can click a Boolean control on the front panel to toggle between the TRUE and FALSE states, which determines the ON and OFF states of an LED. Press <Ctrl-E> to switch to the front panel of the Main VI. Arrange the Boolean controls from left to right. Click Run. The Deployment Progress window appears, which shows the status of the deployment of the Main VI on the NI ELVIS III. 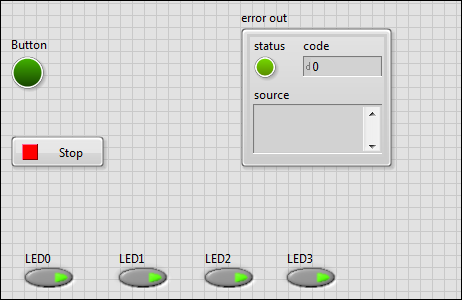 After the deployment is complete, you can toggle the Boolean controls and observe the state changes of the LEDs. Click File»Save to save the VI. You have successfully created a VI that controls the user programmable LEDs. 1 The user programmable button, which is located on the left-hand side of the NI ELVIS III workstation, also aids in connecting the NI ELVIS III to your host computer. Refer to User Programmable Button for more details about the dual purposes of the button.